It is the first Sunday with my new appliances and I thought the best way to christen them would be with this meal. These are some good Southern favorites, all of which I will share in the future. 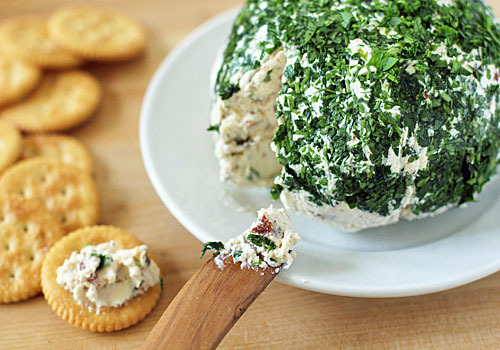 Today I am sharing the recipe for the appetizer. Cheese ball. These two words are normally used derisively in the description of someone or something. The emcee at the awards dinner with his bad jokes and saccharine sentiments--cheeseball. The guy obviously past his prime still rocking the mullet and Oakleys at the hair band triple bill at the State Fair--big time cheeseball. I don't know how this descriptor came into use. I do know that a cheese ball can taste really good. This one offers plenty of taste and crowd pleasing attributes to make it a good fit for most any occasion. Cream cheese, mayonnaise, parmesan cheese, and bacon--need I say more?! Any leftovers are wonderful slathered on a piece of bread with a big slice of tomato. So give this cheese ball a chance. It's so good that it just might make you reconsider the term. 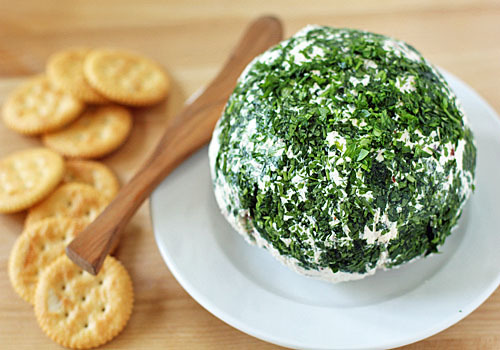 Using an electric mixer, combine the cream cheese, mayonnaise, and parmesan cheese in a large bowl until well blended. Stir in the bacon and green onions. Add the black pepper, salt and cayenne pepper if using. Using a rubber spatula, gather the cheese mixture into a rough ball. Lay out a sheet of plastic wrap and scatter the parsley all over. Transfer the ball to the plastic wrap. Tightly wrap the cheese ball in the plastic wrap making sure the parsley adheres, twisting at one end to form a tight ball. Chill the ball for at least 3 hours. When ready to serve, remove the plastic and place the ball on a serving plate. serve with assorted crackers and vegetables. Enjoy! Ahhh... new appliances??? I'm envious!! Love the cheese... as I finish up my glass of wine the cheese and crackers would be a perfect complement. Nicely done! I'm looking forward to the other recipes too! I am so pleased you are enjoying my blog:) Thank you for letting me know. I hope you enjoy the pudding. Best! What wine would you have with this? I'm certainly not a sommelier, but for a white wine, I would suggest a Sauvignon Blanc or Chenin Blanc. A blended red wine or Cabernet would pair as well.